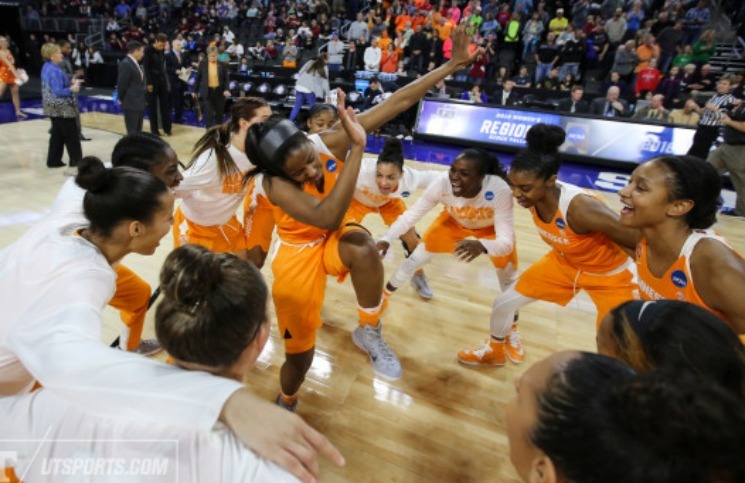 The Lady Vols continue to put together a surprising run through the NCAA tournament, following a season of historic lows with a postseason stretch that has included wins over No. 10 seed Green Bay, No. 2 seed Arizona State and now No. 3 seed Ohio State. They knocked off the Buckeyes 78-62 in Sioux Falls, S.D., last night to advance to the Elite Eight, where they’ll face No. 4 seed Syracuse, who upset top-seeded South Carolina on Friday evening, on Sunday at 3:30 pm ET on ESPN with a trip to the Final Four on the line. Behind a career night from Mercedes Russell, Tennessee will play for a spot in the NCAA Final Four after defeating Ohio State, 78-62, in the Sweet 16 at the Denny Sanford PREMIER Center Friday night. In the midst of their best stretch of the season, the No. 7 seed Lady Vols (22-13) have won six of their last seven games to advance to the 28th Elite Eight in program history. Despite reaching the Sweet 16, Ohio State (26-8) finished the season losing four of its last seven. Holly Warlick has led UT to three Elite Eights in her four seasons as head coach. Her squad will face No. 4 seed and #14/15-ranked Syracuse (28-7) on Sunday at 3:30 p.m. ET (2:30 CT) on ESPN. The Orange, which Tennessee defeated on Nov. 20 in Knoxville, 57-55, advanced to the Elite Eight by toppling No. 1 seed and #3/2-ranked South Carolina, 80-72, in Friday’s first game in Sioux Falls. Russell’s dominance throughout the game led to her best performance donning the orange, scoring a career-high 25 points on 12-of-16 shooting. She also collected 15 rebounds, matching a career-best. Te’a Cooper (16), Bashaara Graves (14) and Diamond DeShields (10) all scored in double figures for the Lady Vols, while Ameryst Alston led the Buckeyes in scoring with 21 points. Tennessee’s starting frontcourt of Graves and Russell combined for 39 points. Tennessee shot 50 percent from the field on 31-of-62 shooting and scored 50 paint points. Ohio State finished 22-of-67 (37 percent). The Lady Vols dominated the majority of the game, holding the lead for over 38 minutes and stretching the margin by as much as 22.